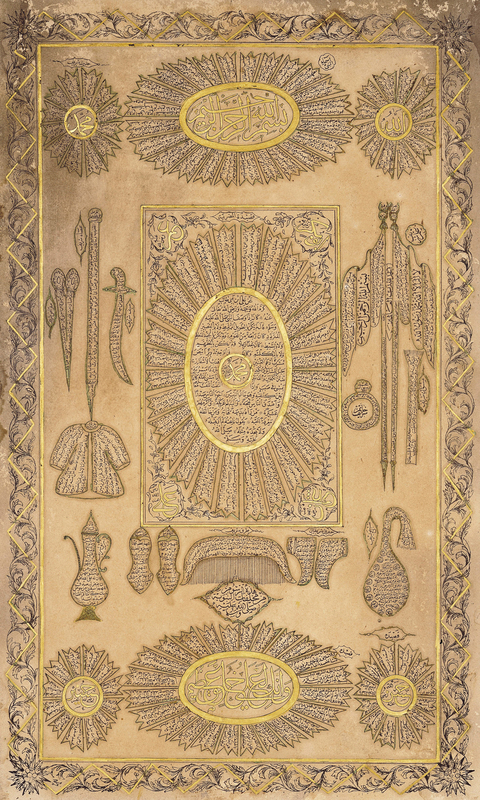 This calligraphic piece combines the full version of the hilyah according to ‘Ali (in the central oval) with depictions of the Prophet’s personal effects. These include his banners and signet ring (on the right); his sword, walking stick, scissors and cloak (on the left); his rosary, boots, comb, sandals and ablution ewer (below). 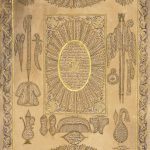 These depictions are filled with payers, Qur’anic verses and other inscriptions. Other texts include the al-Asma’ al-Husna (the Ninety-nine Names of God), the epithets of the Prophet, hadith, a panegyric on the Prophet, a poem entitled Qasidat al-Hilyah, and a poem about the Prophet. N.F. Safwat, The Art of the Pen. Calligraphy of the 14th to 20th Centuries, The Nasser D. Khalili Collection of Islamic Art, volume V, London 1996, cat.38, pp.66–7.